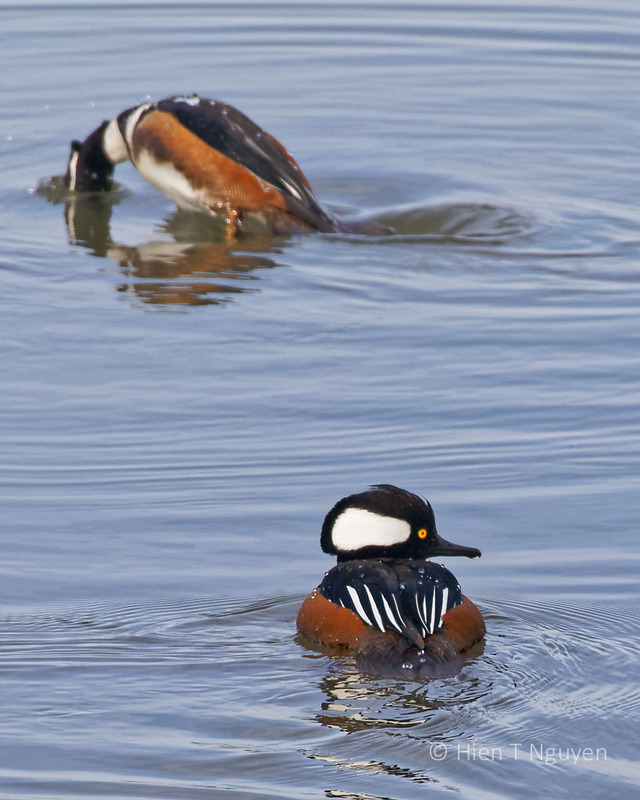 Hooded Mergansers are small ducks that are seen in the fall and winter at the Edwin B Forsythe National Wildlife Refuge. 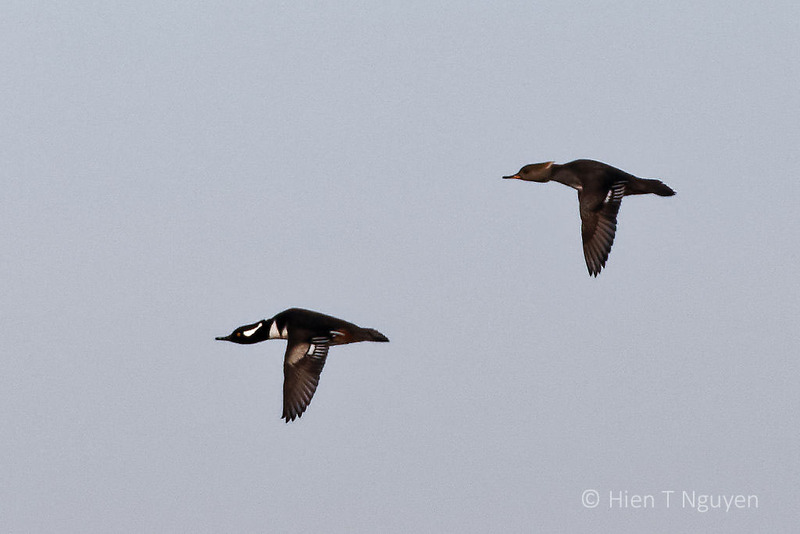 The male ones have a prominent crest (hood) in black and white, making them stand out from other ducks. 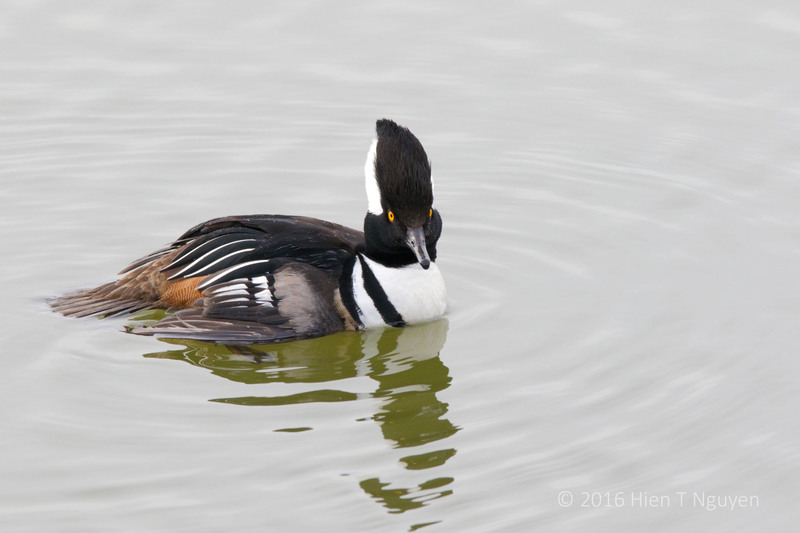 This year there seems to be many Hooded Mergansers, male and female, and I had no problem shooting the following photos. 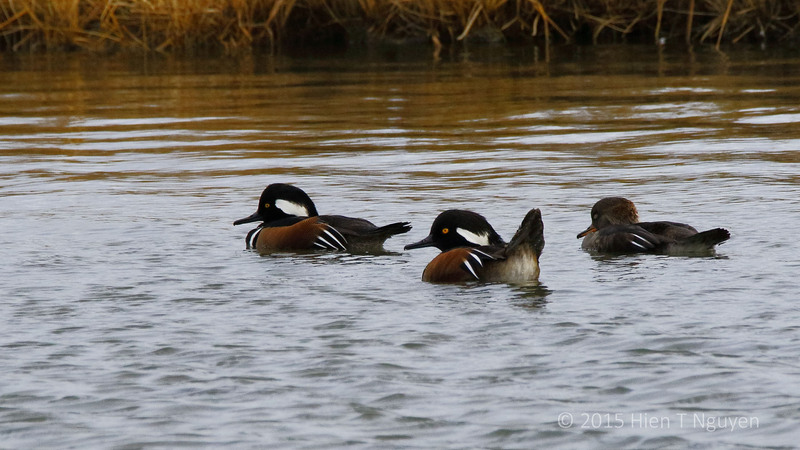 Hooded Margansers. 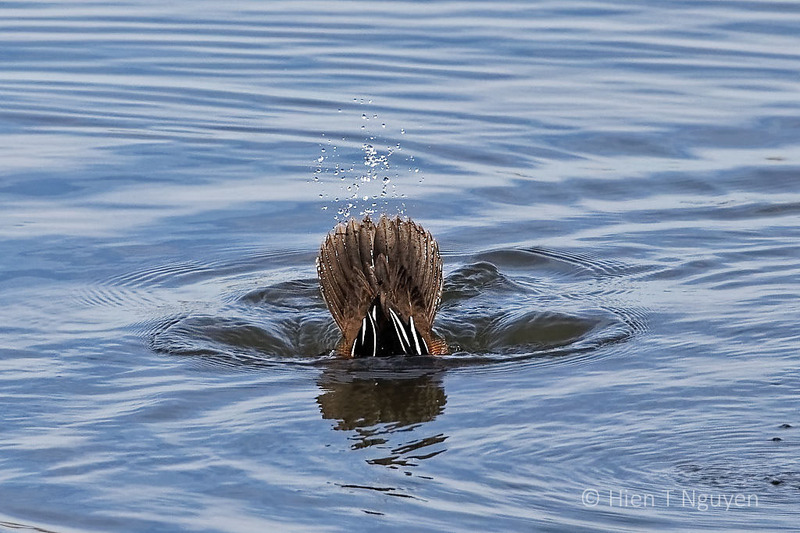 The male was just coming out of a dive. 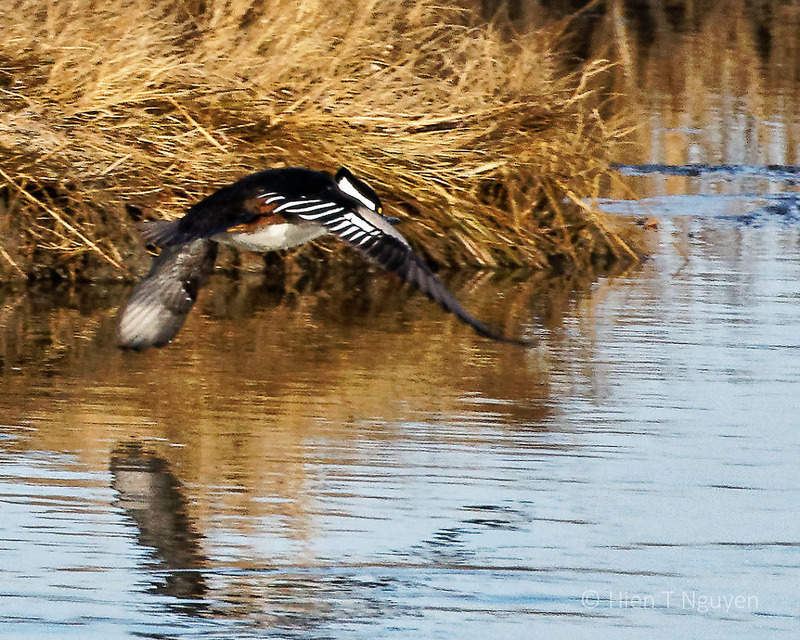 As I was taking a shot, one Hooded Merganser decided to fly. 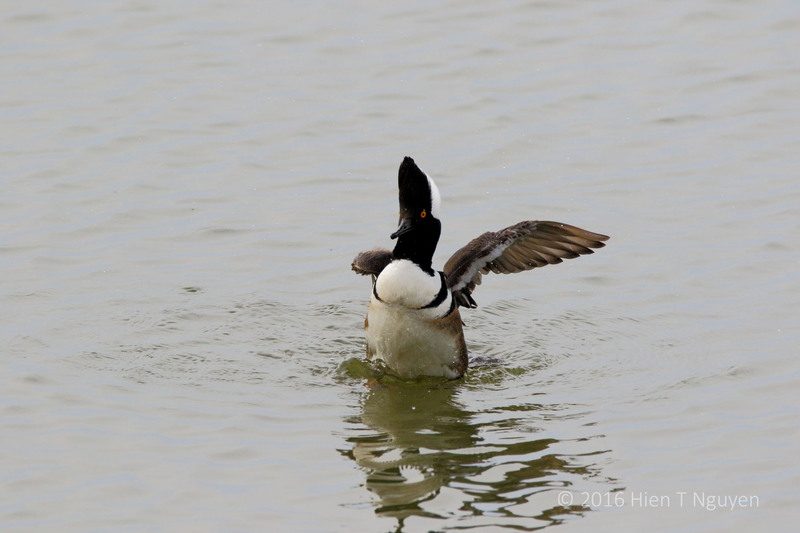 I missed capturing that take-off. 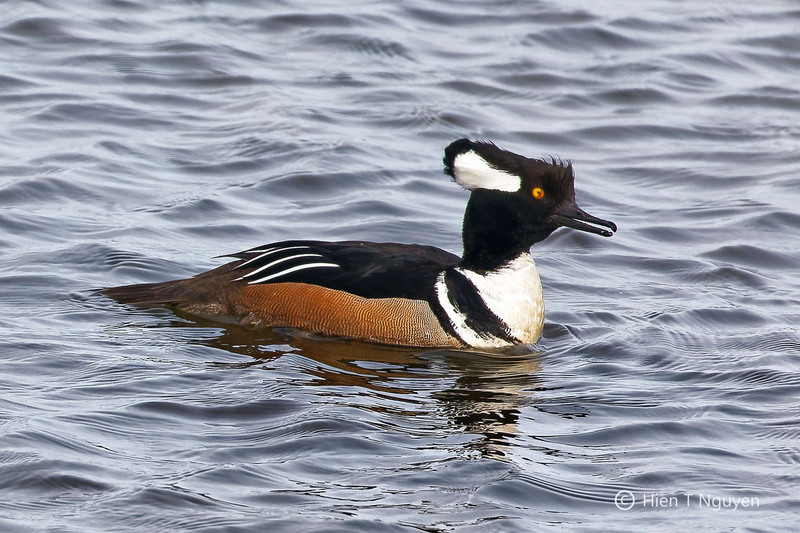 The following day, almost at the same place, I was chatting with a fellow photographer when a male Hooded Merganser decided to fly. 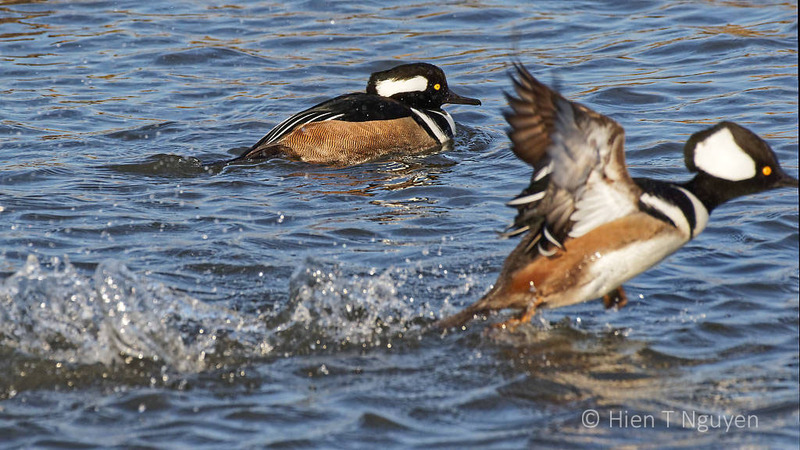 Male Hooded Merganser starting flight. 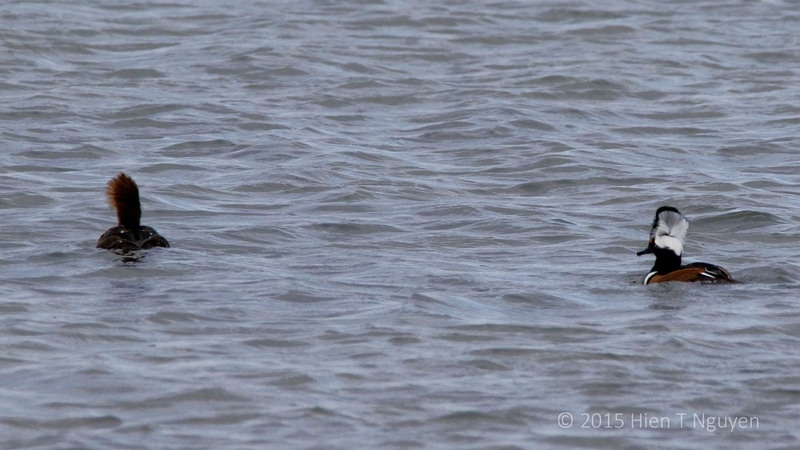 After about a minute, I saw him, accompanied by a female, flying overhead. 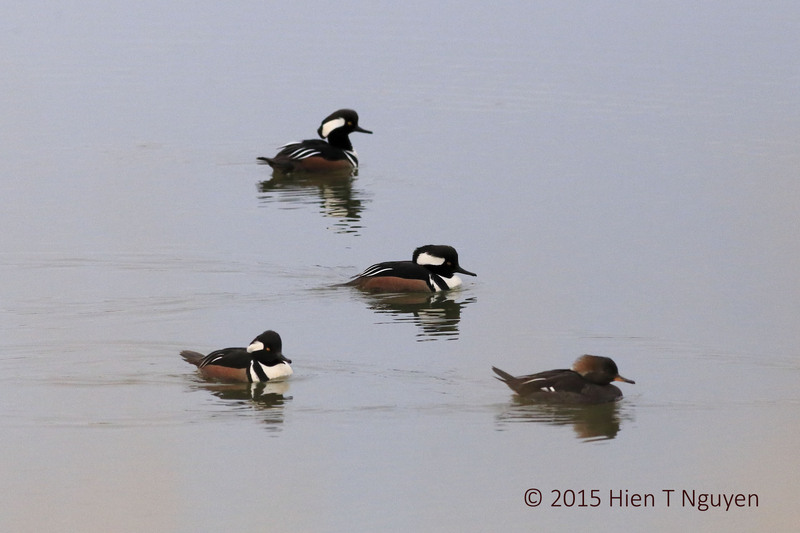 Before the coming monster snowstorm descends on us tonight, I am posting photos of Hooded Mergansers taken last week. 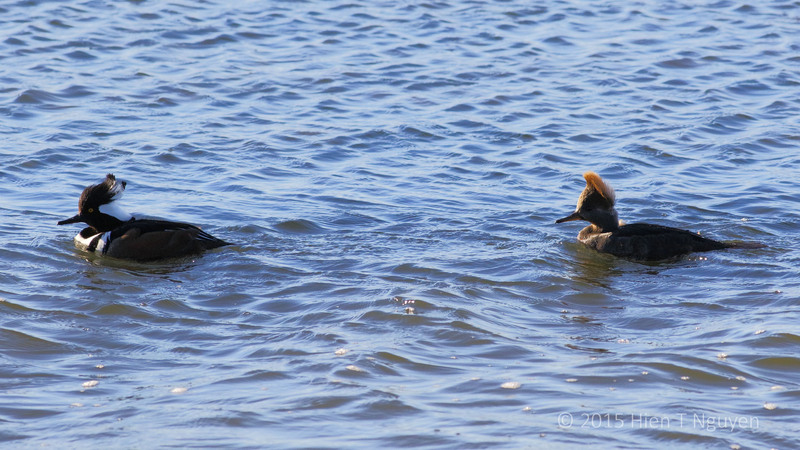 There were quite a few of them searching for food and socializing among themselves. 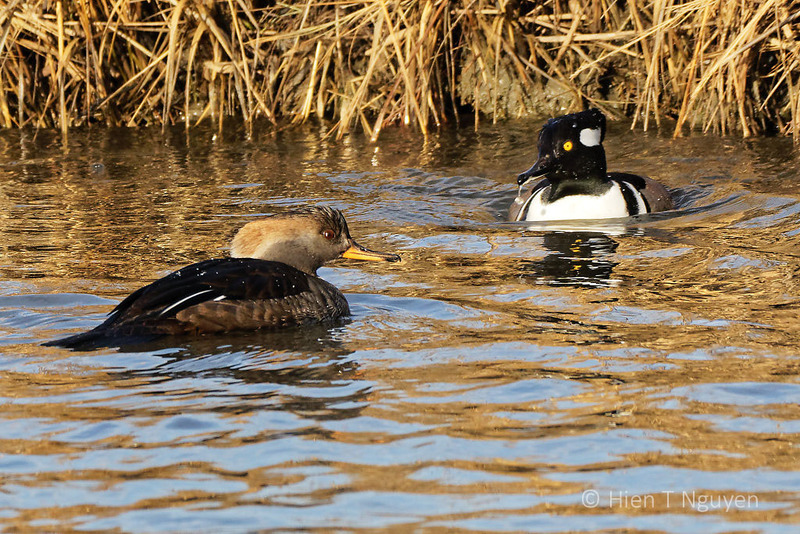 They were real dandies, at least among ducks. 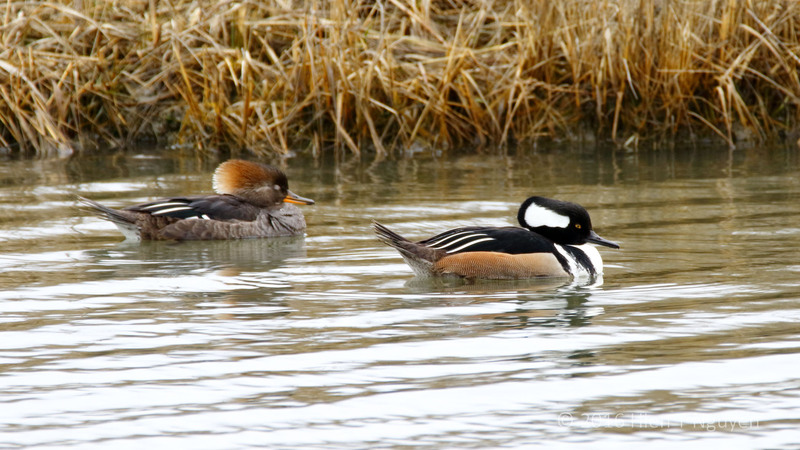 Male Hooded Merganser with two females. 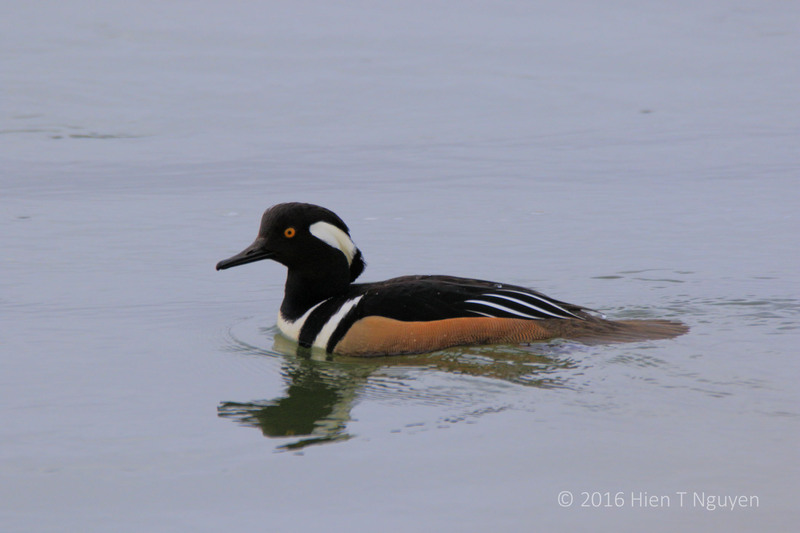 Yesterday was cloudy all day, but I went out anyway to the Edwin B Fortsythe National Wildlife Refuge near Brigantine, NJ to see what I could photograph. 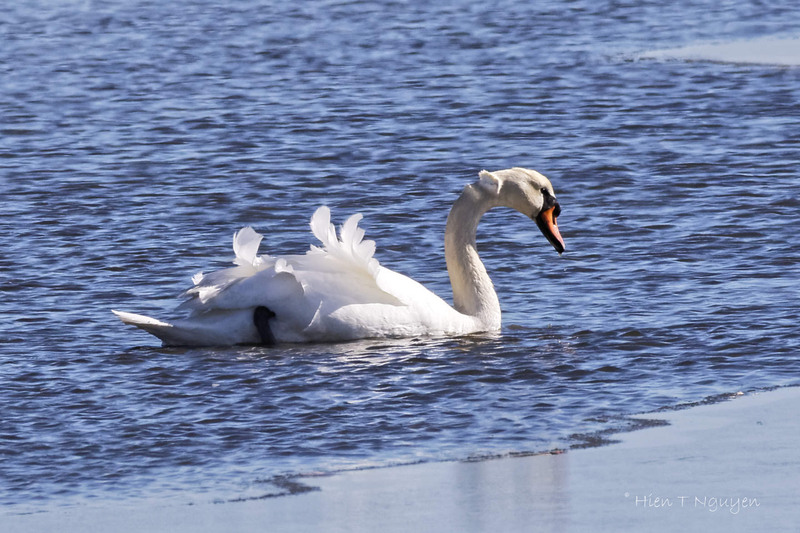 It turned out to be not much. 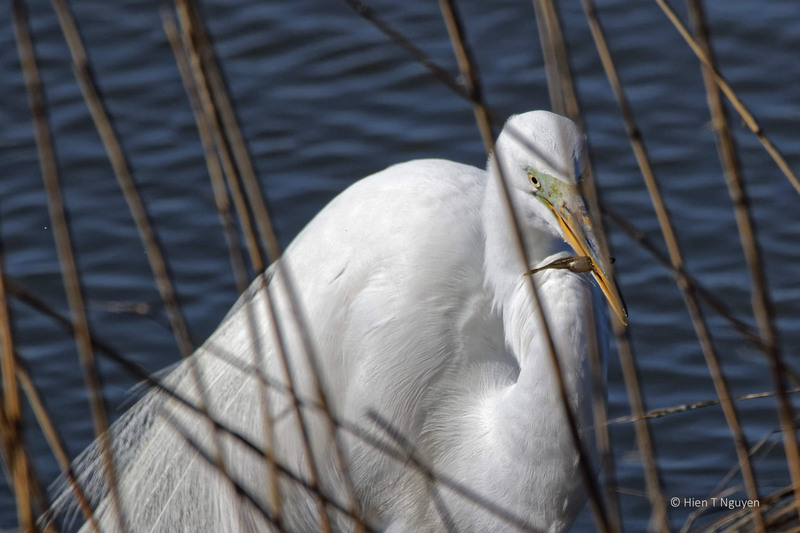 Most of the photos turned out mediocre at best and had to be discarded. 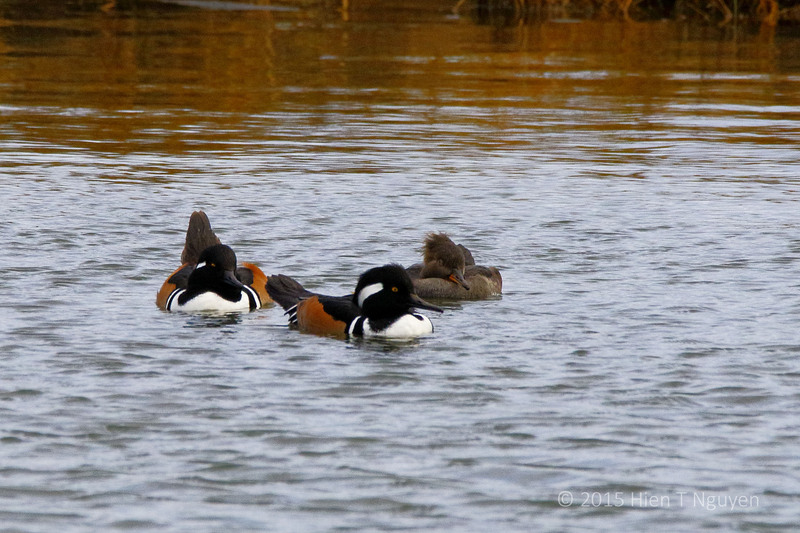 However, it was high tide and at two of the locations where sea water came into to the marshes I found Hooded Mergansers and Buffleheads merrily diving for food. 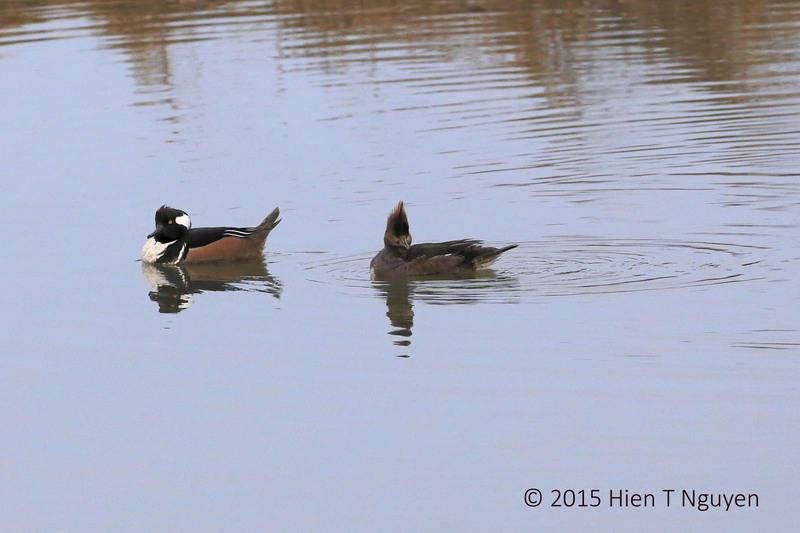 Buffleheads are small ducks, even smaller than Hooded Mergansers. 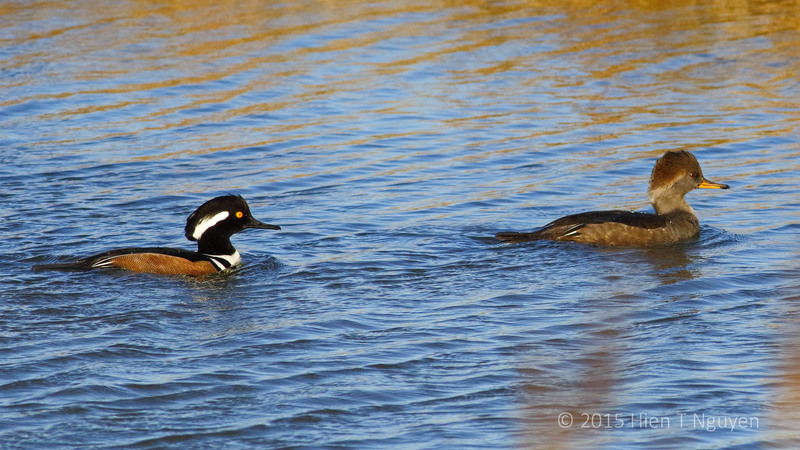 They kept their distances, and I could only get one good shot at a pair. 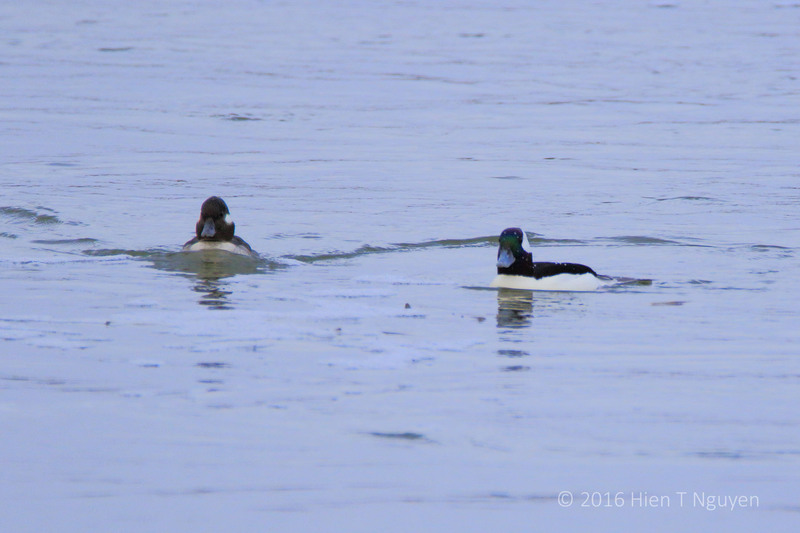 Buffleheads, female on left, male on right. 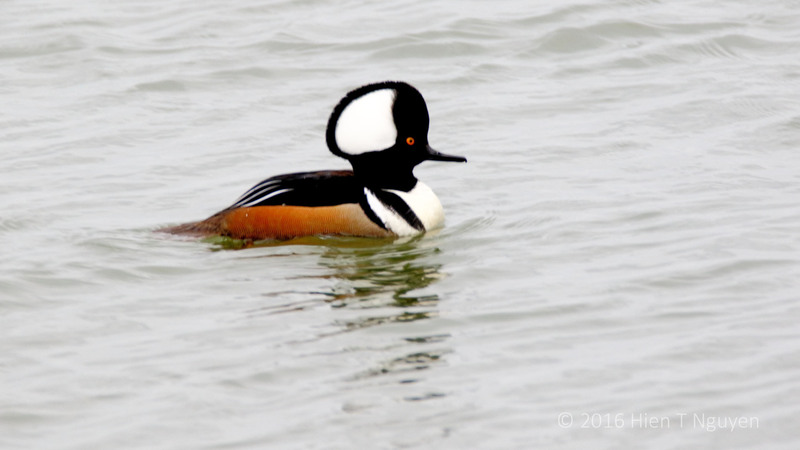 The male had a glossy green forehead, which would have been more colorful in better lighting. 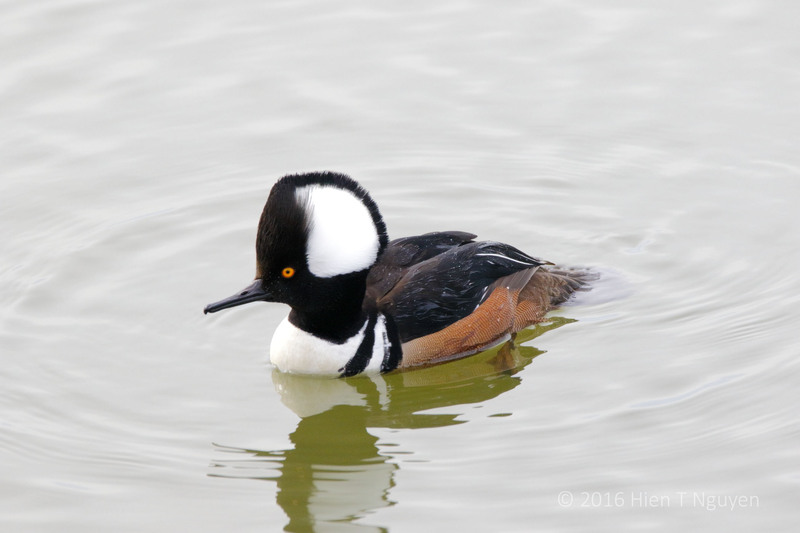 The Hooded Mergansers were bolder, coming within 30 ft, seemingly undisturbed by the guy with a white car and a black camera. 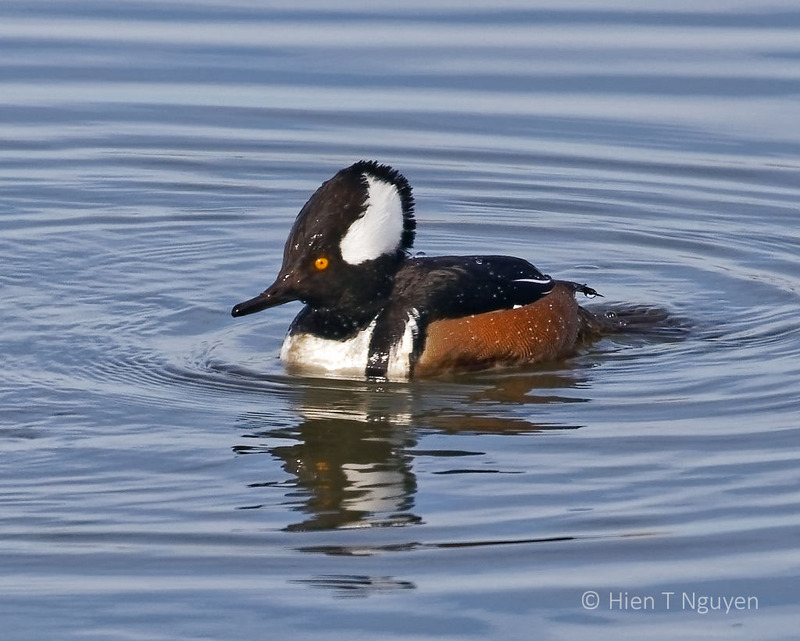 Male Hooded Merganser. 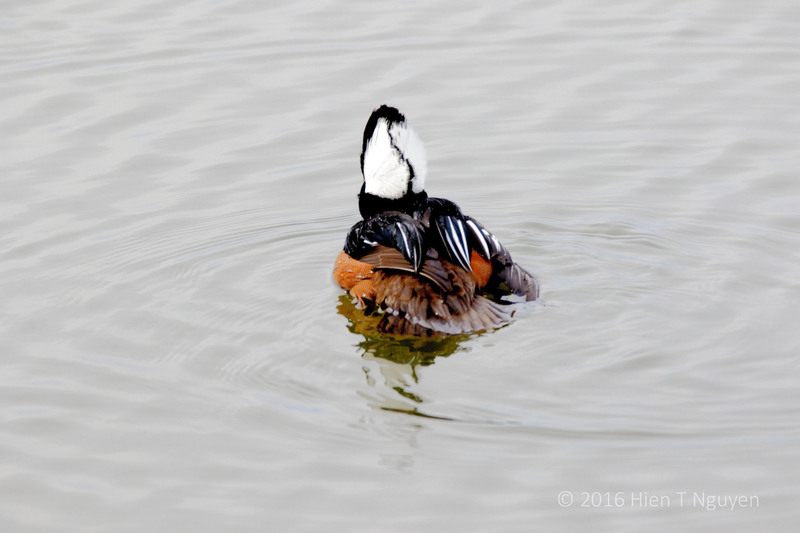 He had been diving so his crest or hood was tamped down. 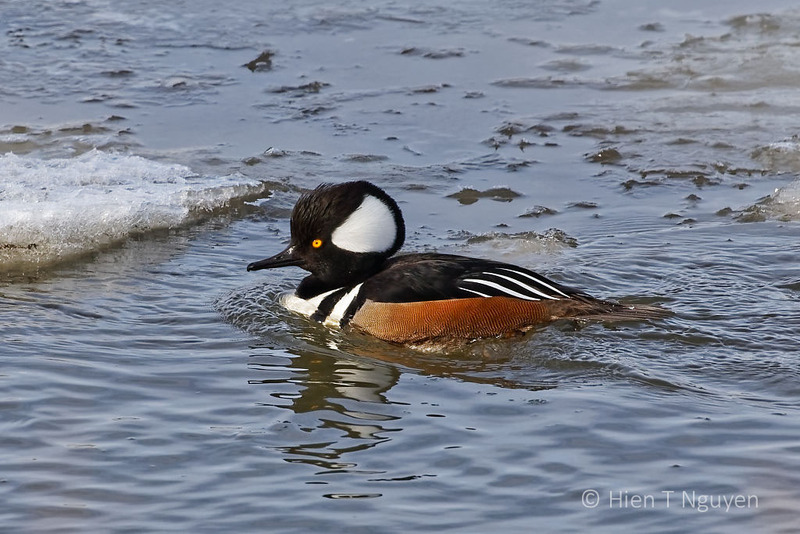 There were several female Hooded Mergansers who looked quite coquettish even as they dived and resurfaced constantly. 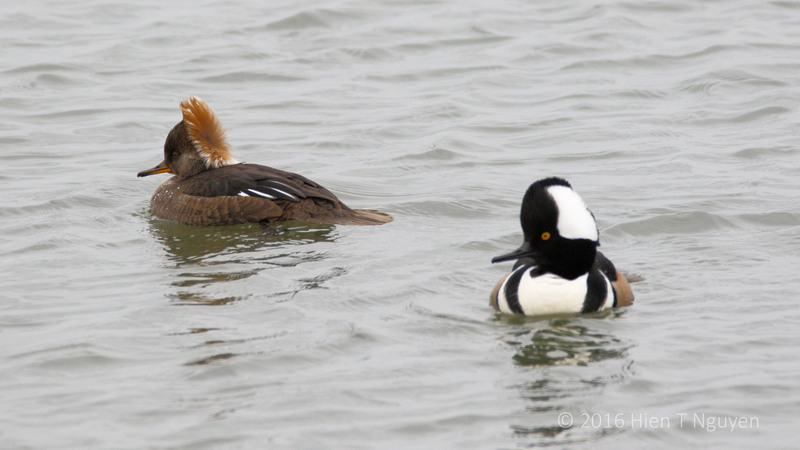 Three days ago, Hooded Mergansers were still in abundance at Vogt Pool South, a freshwater pool at the Edwin B Forsythe National Wildlife Refuge. 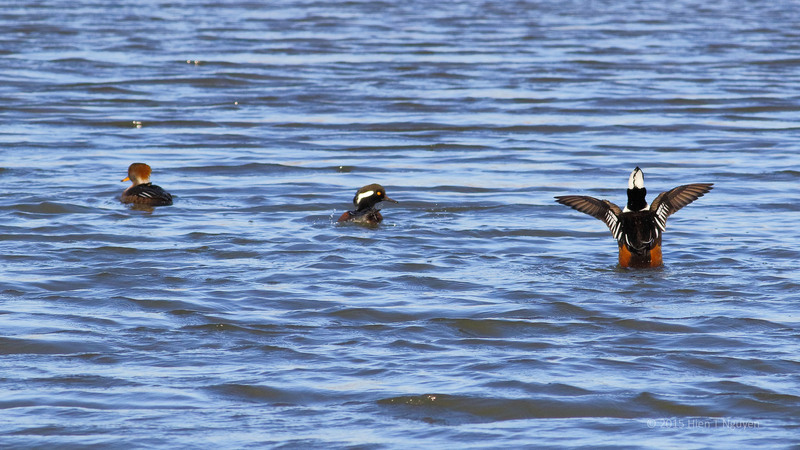 They swam and dove looking for food, ignoring the very strong wind that at times pushed my camera and its long lens sideways. 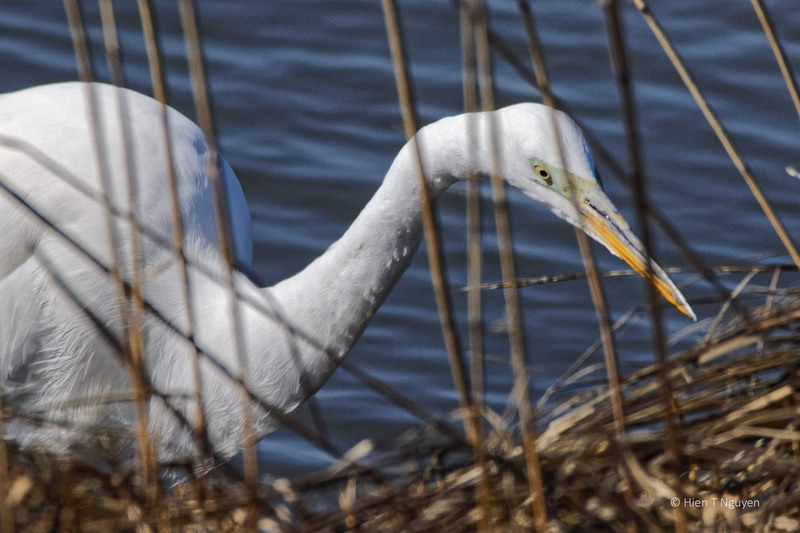 I had to take most of the following shots from well inside the car. 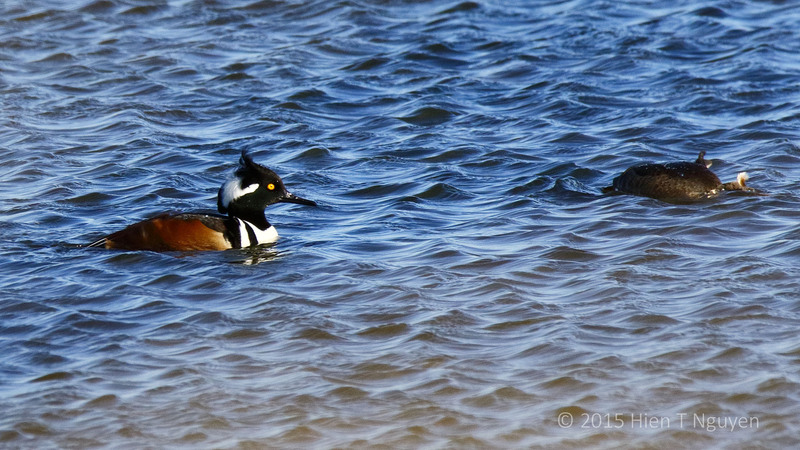 A pair of Hooded Mergansers swimming together. 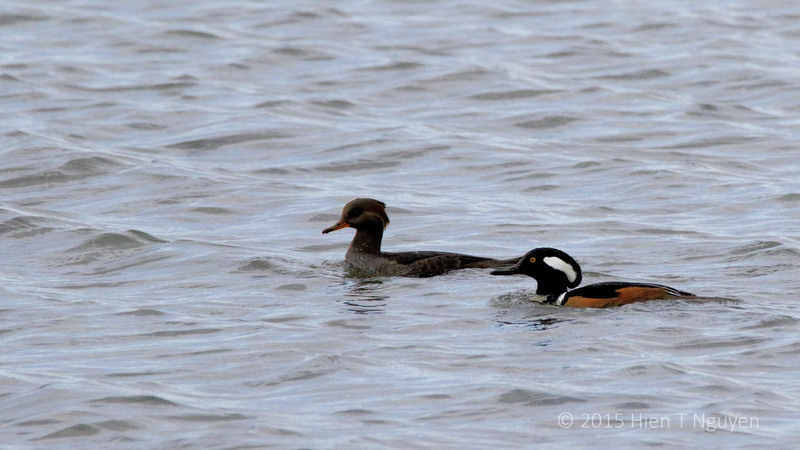 Waterfowl Kabuki: The lonely Hooded Merganser on the right protested his isolation. 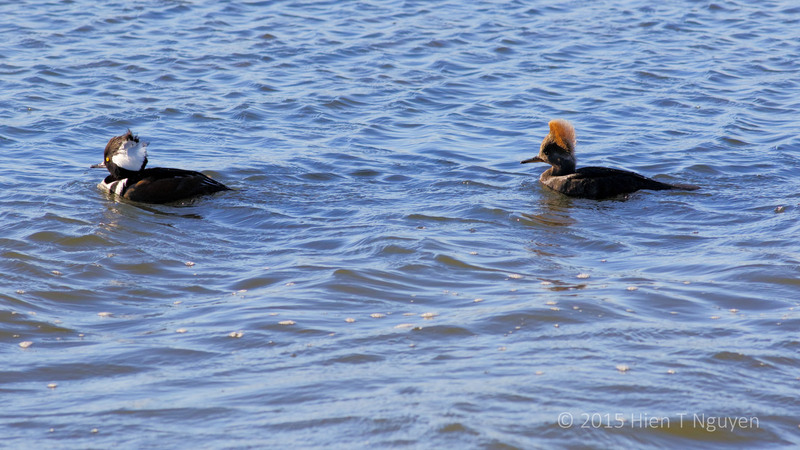 Meanwhile, the wind caused another bad hair day for these ducks, again. 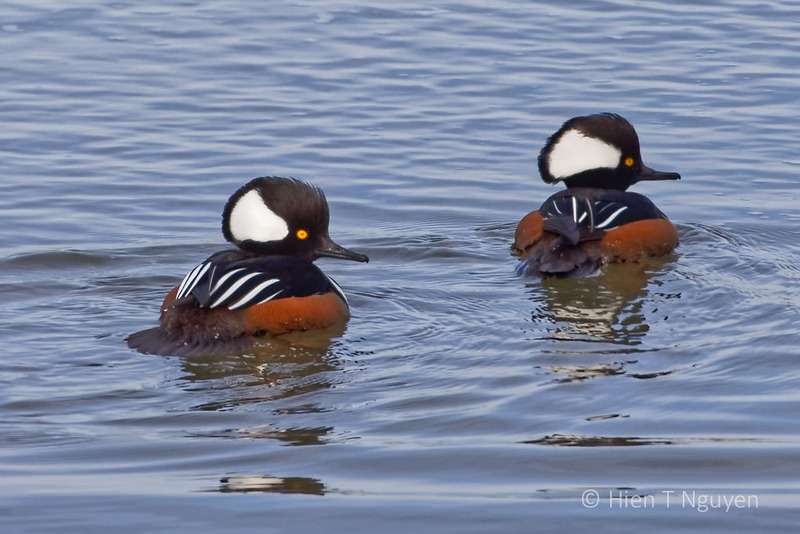 Hooded Mergansers with wind teasing their crests. 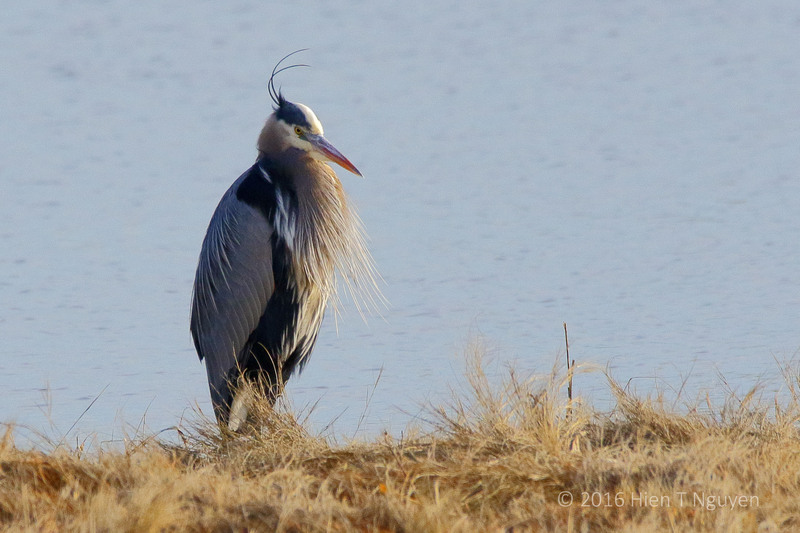 Bad hair: it got worse. 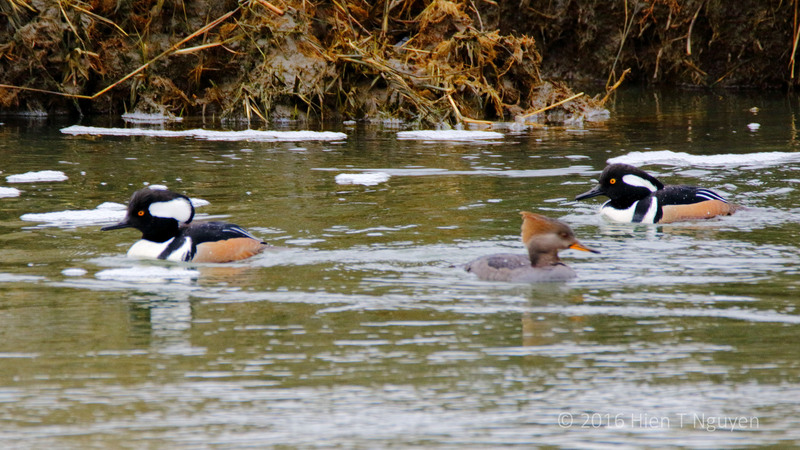 It got so bad that one female Hooded Merganser had to hide her head in the water. 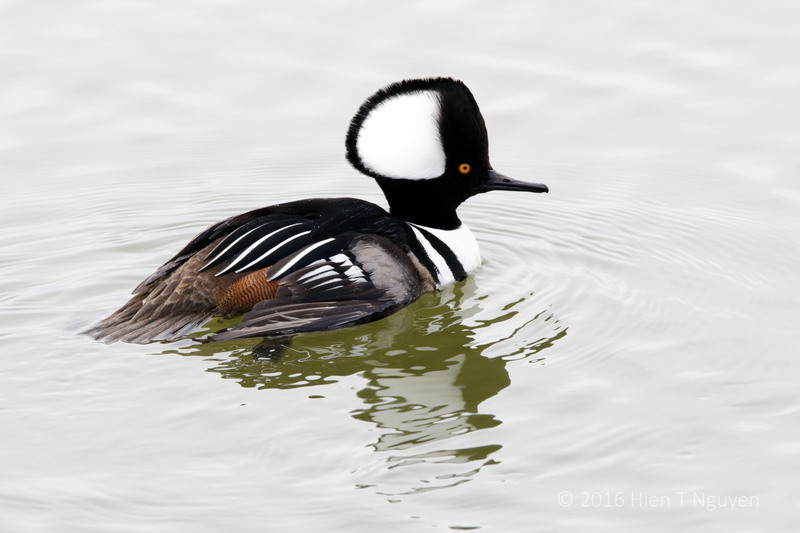 Hooded Mergansers are good-looking ducks with their crest, or hood, which is black and white for males and cinnamon for females. 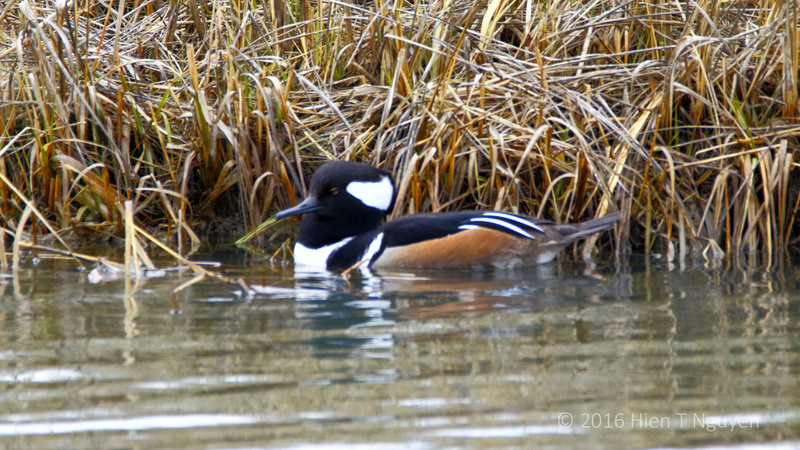 They are not as rare as Harlequin ducks, and I see them every year around this time of the year around many ponds and marshes in our area. 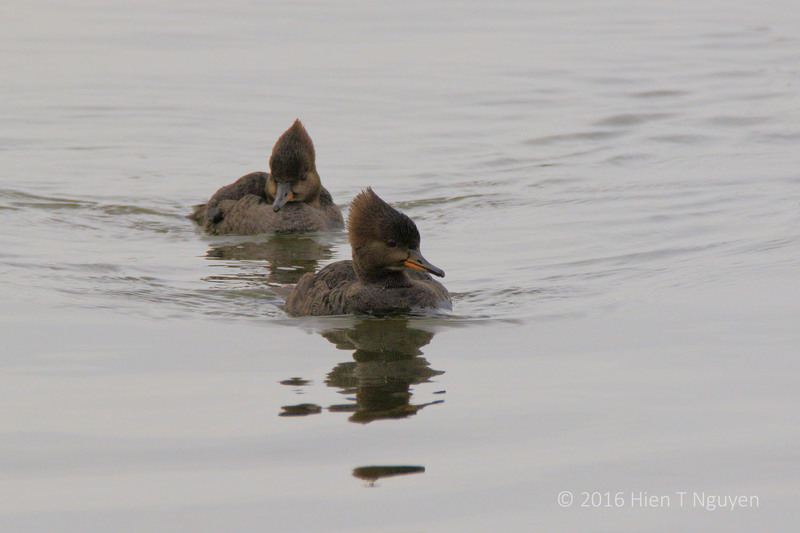 Last week there were several swimming around the Danzenbaker Pool at Edwin B Forsythe National Wildlife Refuge. 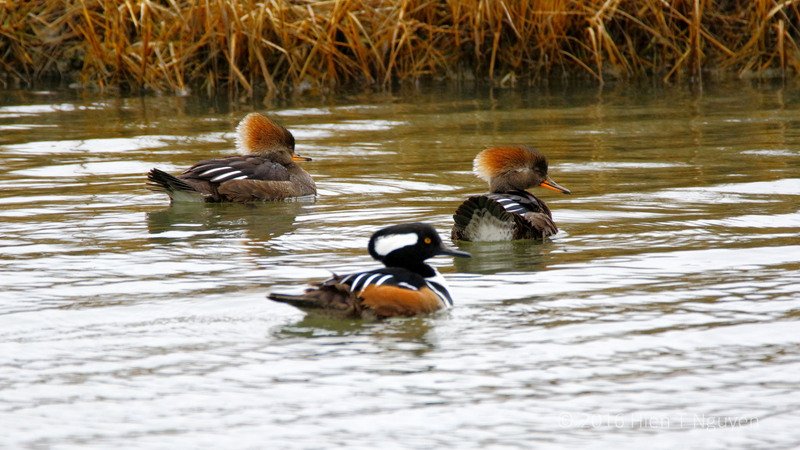 Hooded Mergansers, two males and one female. 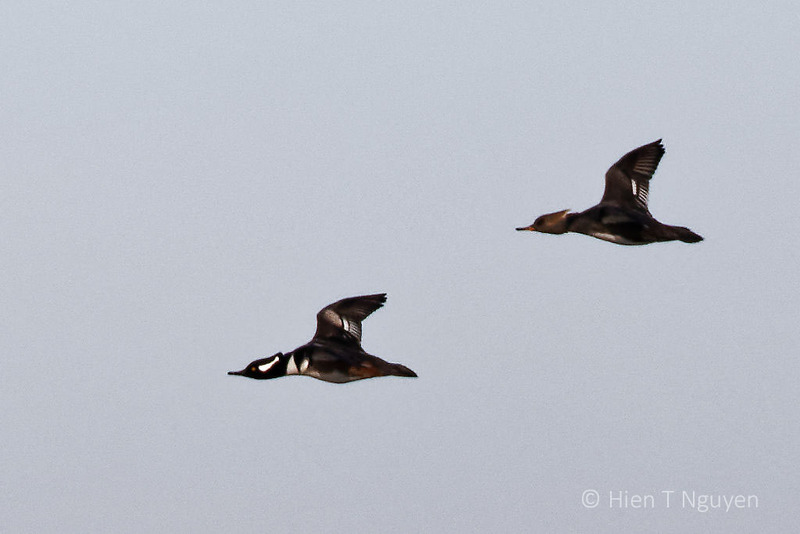 Same trio of Hooded Mergansers. 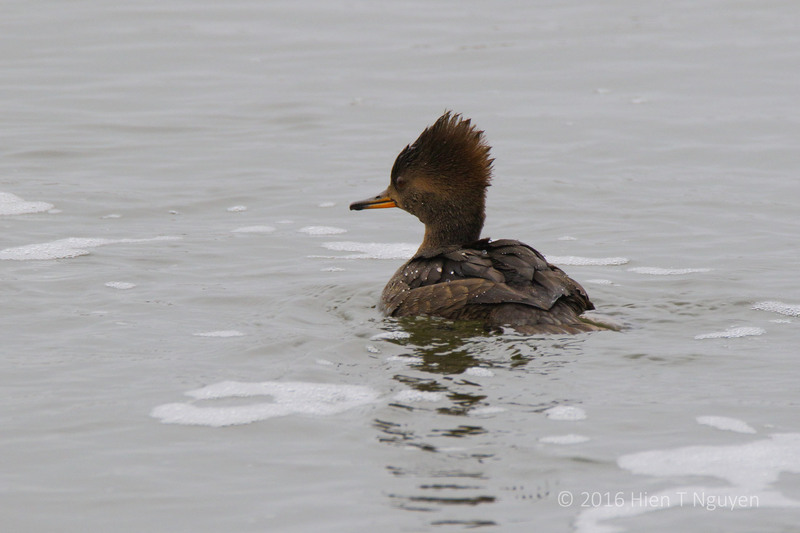 Further East of the pool, a couple of these ducks had just emerged from a dive, their crest feathers matted down, making them look well coiffed.. 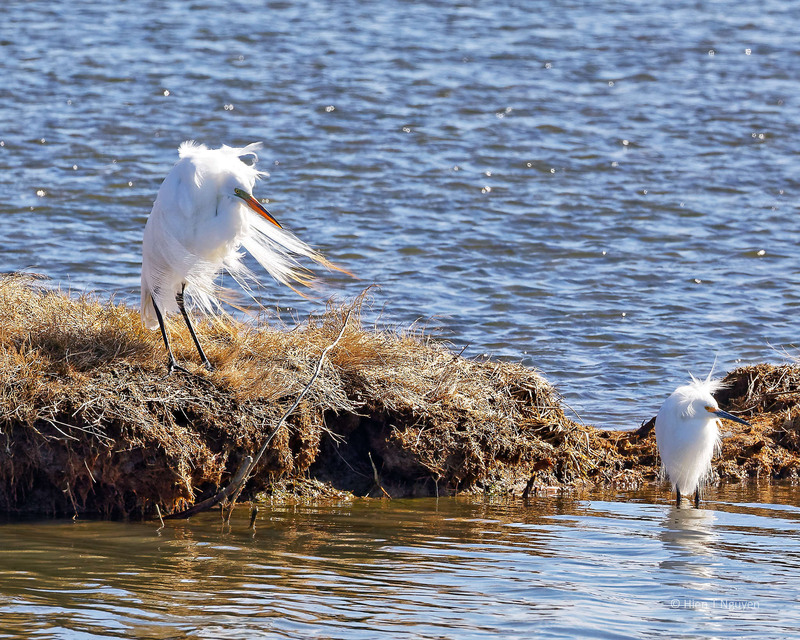 However, as they turned, the strong wind gave them a bad crest, or bad hair, day. 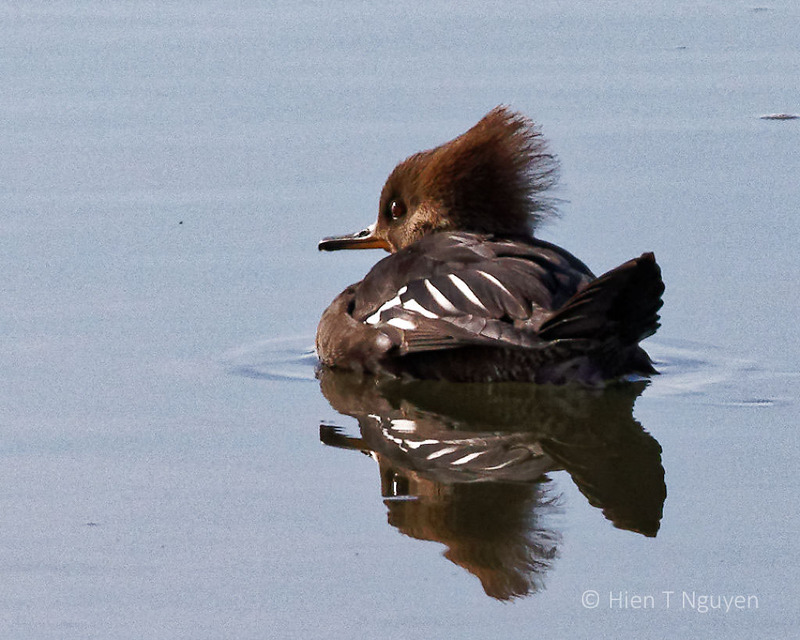 Hooded Mergansers having a bad hair day. 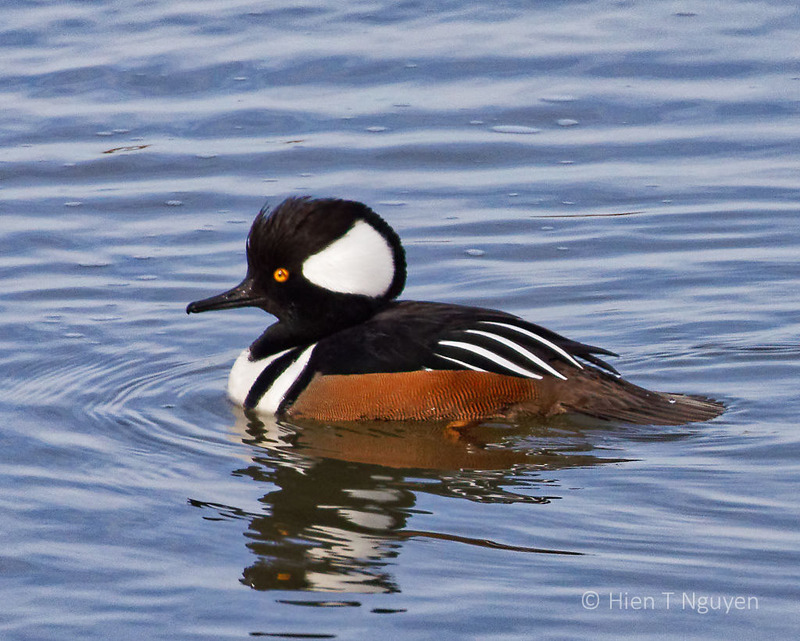 Hooded Mergansers are handsome ducks, easy to identify, especially the males with their black and white crests. 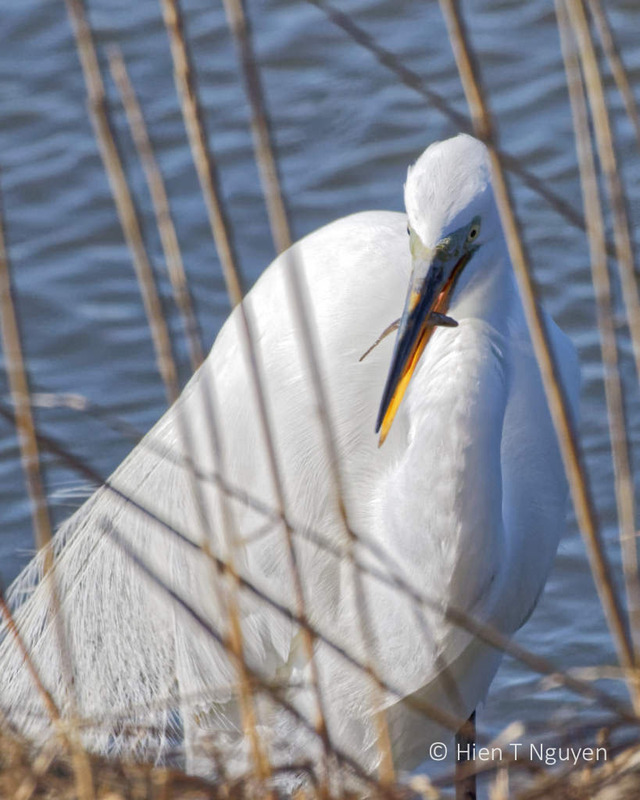 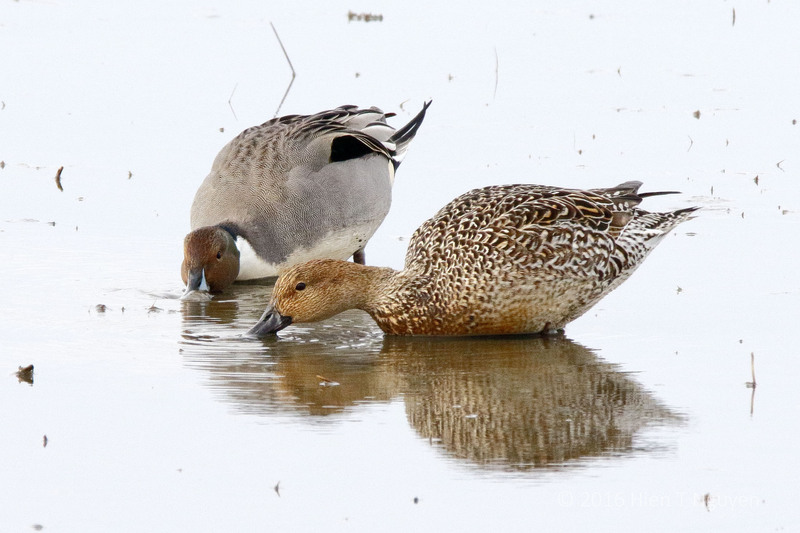 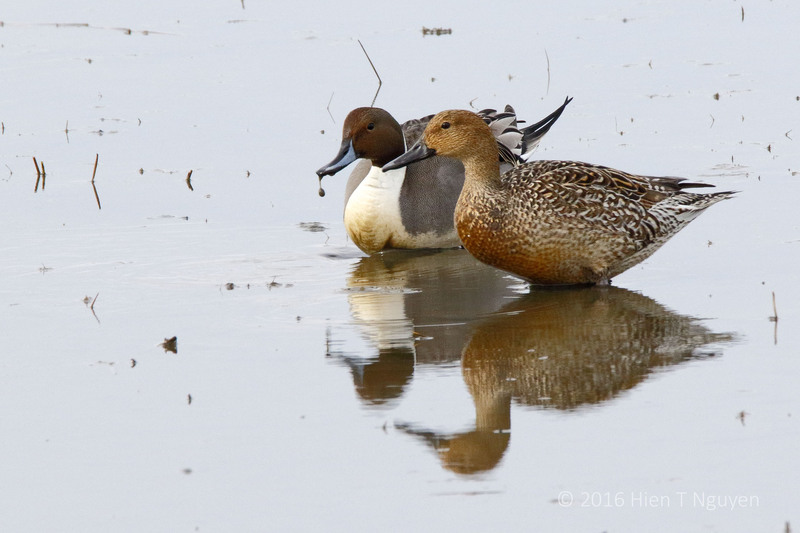 They were in abundance in every pond at the Edwin B Forsythe National Wildlife Refuge this past weekend. 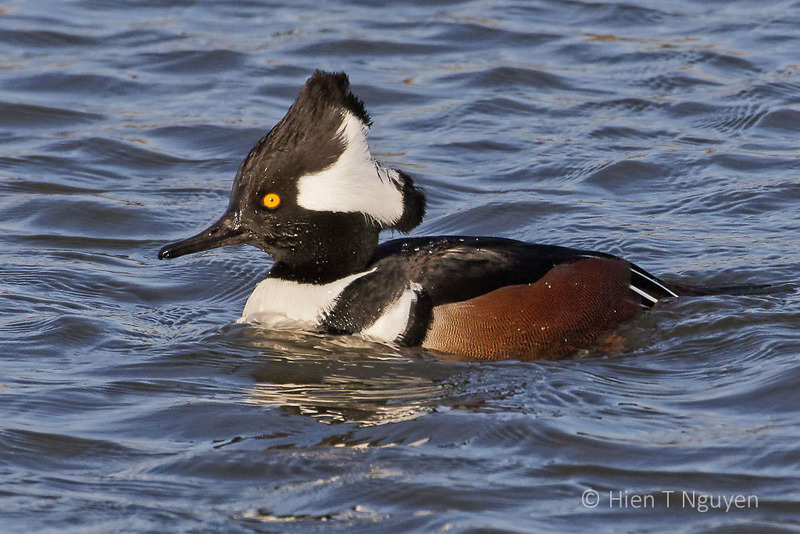 In courtship, the male expands his crest while making deep, low sounds to attract the female.